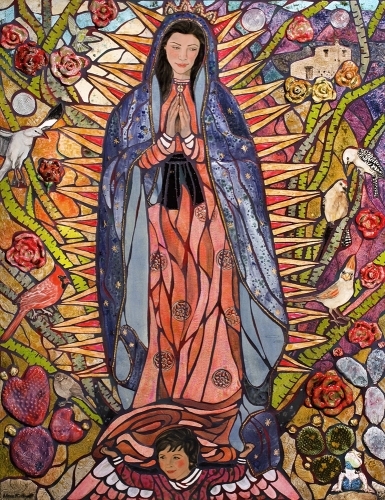 I have portrayed Guadalupe as the “mother of all the creatures”. In this mosaic, my birds Anya, Chopra, Fyre, Thrasher, Air-Bender, Piglet, Karma, and my lizard Marco were my models. They are regular visitors to my garden. The “Mission In The Sun” and the Catalina Mountains are in the background of my mosaic. In 1953, artist Ted DeGrazia built and dedicated the mission to Guadalupe. It is on the grounds of his Gallery In The Sun in Tucson, Arizona. The background tiles have impressions of rose lace. Many exotic glazes and grout colors complete the mosaic.